They don’t just look bad – they can actually cause you a lot of pain and even limit your ability to be active. And, if you have a bunion, then you may be wondering what you can do to treat, and when – or if – you should start thinking about surgery. Here at Austin Foot and Ankle Specialists we always recommend trying conservative approaches to relieve your bunion pain first – you may find pain relief through easy treatments by reducing pressure on the big toe like wearing wider footwear or using pads in your shoes. However, if these methods don’t quite seem to help your condition, then we can start discussing the benefits of surgery. Note that usually if your bunion is not causing pain, then you most likely don’t need surgery. Though we understand that bunions often get bigger over time, surgery is not recommended to prevent bunions from worsening since in most cases you can slow the progression of a bunion with proper shoes and other preventive measures. So, bunion surgery should not be done for cosmetic reasons. After surgery, it is possible for chronic pain to develop in the affected toe when there was no bunion pain prior to surgery. 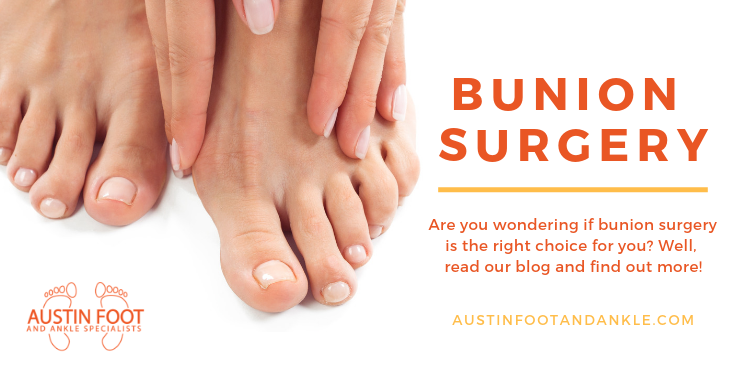 The good news is that our foot experts here at Austin Foot and Ankle Specialists can help you decide if bunion surgery is the right choice for you. When you come visit us at our Texas office, we will perform a thorough examination of your condition and put together a plan that will most benefit you. Is Bunion Surgery the Best Choice for You? If you are experiencing foot pain that limits your everyday activities like walking and wearing shoes. If you are experiencing chronic inflammation and swelling that does just doesn’t seem to improve even with rest and/or medications. If you have developed a toe deformity. Bunion related deformities usually happen when the big toe drifts toward the smaller toes. If your big toe has become stiff and unable to bend or straighten. If you have found no pain relief even after footwear modifications. If one or more of these apply to you, then we are likely to recommend bunion surgery in order to correct your condition. However, it is important to have realistic expectations when it comes to this type of procedure – though bunion surgery will help relieve pain, it may not always allow you to wear smaller shoe sizes or narrow footwear. In fact, bunion surgery may altogether restrict the types of shoes you wear. How Does Bunion Surgery Work? The general objective of most bunion surgeries is to reposition the metatarsophalangeal joint at the base of the big toe in order to relieve pain and correct the deformity of the bones. Most people don’t need a general anesthetic during bunion removal surgery. Instead, you will most likely get a local anesthetic called an ankle block. This type of anesthetic will make you numb below the ankle allowing you to be awake during surgery. Once the anesthetic has taken effect and the area is completely numb, we will remove the bunion and make other necessary repairs to your foot. The surgical time depends on how much of your foot is misaligned – naturally, surgery will take longer if your deformity is greater. As no one person’s feet structure is the same to the next, every bunion correction is a little bit different and there is no reason to be concerned if your surgery takes more time. 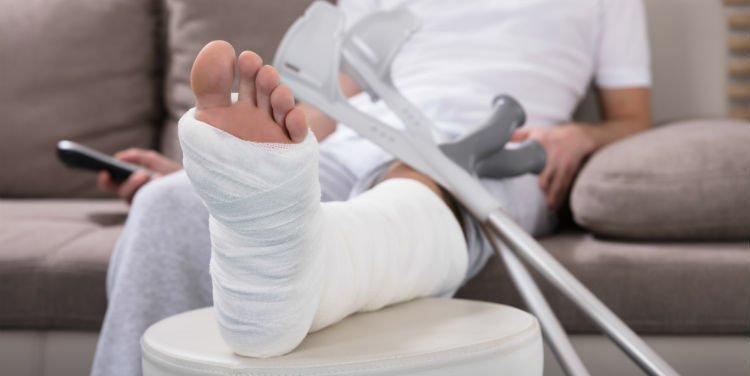 After we complete the surgery, we will bandage your foot and take you to the recovery room where your blood pressure and heart rate will be monitored as you wait for the anesthesia to wear off. Normally, you are able to go home after a couple of hours in recovery. But it is important to have someone available to safely drive you home after the procedure. In order for your surgery to be successful, it is vital that you closely follow recovery instructions at home during the first few weeks after surgery. Part of recovery also means coming into our office for follow-up examinations throughout the following several months to make sure your foot is healing properly. Dressing care. Never disturb or change the dressing without the assistance of a podiatrist – interfering with proper healing could cause a recurrence of the bunion. Be sure to keep your wound and dressing dry at all times – when you are showering or bathing, cover your foot with a plastic bag. Medications. It is important to use medications as directed, and you should stop taking your pain relief medication as soon as the pain begins to improve. But if your pain has not improved within a few days after surgery, then you should seek podiatric advice. In addition to pain medicine, we may prescribe antibiotics to help prevent infection in your wound. Swelling. Keep your foot elevated as much as possible for the first few days after surgery, and apply ice as recommended to relieve swelling and pain. Never apply ice directly on your skin – use a towel for protection. You should also keep in mind that it is common to have some swelling in your foot for 6 months to a year after bunion surgery. Bearing weight. Depending on the type of procedure you have, if you put weight on your foot too early or without proper support, the bones may shift and the bunion correction will then be lost. Though some bunion procedures allow you to walk on your foot right away – in which case, you must use a special shoe to protect the bunion correction – many bunion surgeries require a period of no weightbearing to ensure complete bone healing. In addition to no weightbearing, driving may also be restricted. This is especially true if the surgery was performed on your right foot. Physical therapy and exercise. Specific exercises will help restore strength and range of motion after surgery. We will provide you with some great exercise routines when you come visit us. Footwear. When you have completed the initial rehabilitation period, we will then advise you on footwear – athletic shoes or soft leather oxford type shoes will best protect the bunion correction until the bones have completely healed. You should also note that we may recommend that you never return to wearing high-heeled shoes as these can be seriously detrimental to your improvement. All in all, the common theme throughout all these recovery steps is to follow rehabilitation instructions very closely. And, if you suspect that there is something unusual going on during this sensitive time, then you should seek medical advice immediately. Our goal here at Austin Foot and Ankle Specialists is to do what is best for you and your foot health. We understand the value of conservative care and see surgery as a last resort – though we also recognize when it is time for a more aggressive approach. So, if you are not quite sure about whether it is time for bunion surgery, come visit us! Better yet, come visit us long before your bunion situation gets to that point – the earlier you seek treatment, the more likely conservative care will be effective in your specific case. Schedule an appointment with us today! All you have to do is call (512) 328-8900 or request an appointment online.